Thursday, December 1, 2016 • 6:00–10:00 p.m.
Join us for First Thursdays (the first After Dark of the month) when we explore one topic in a variety of ways. Tonight, excite your atoms at Glow, our annual festival of ebullient lights and subtle glows celebrating the close of the year. Bask in the mesmerizing gleams of special installations and kinetic sculptures, take a shine to illuminating exhibits, and show your sparkle with scintillating activities. 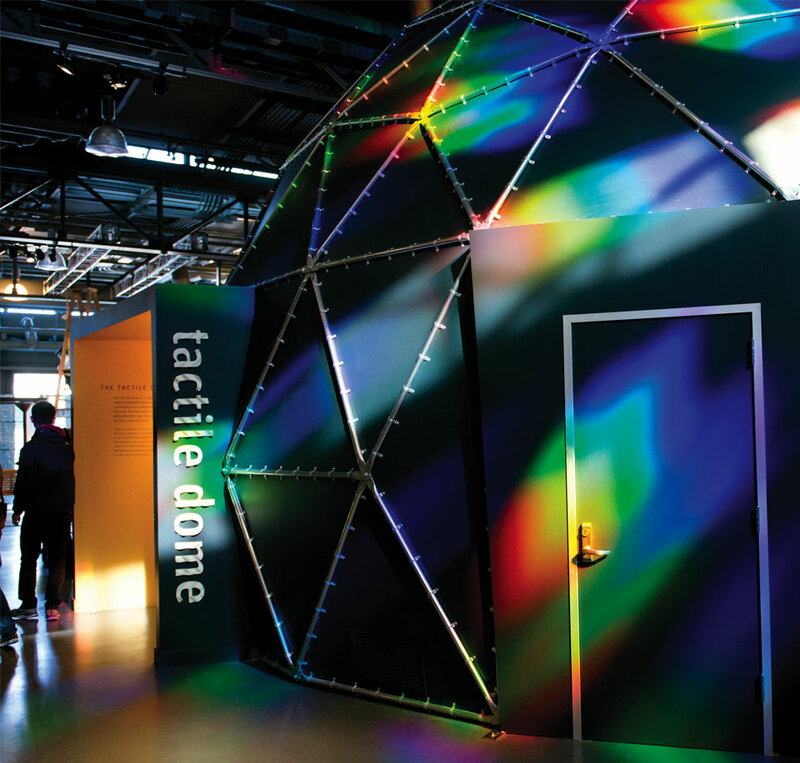 Also tonight: Crawl through our pitch-black Tactile Dome, and explore exhibits and demonstrations. Join sound artist Krys Bobrowski as she transforms Illuminatoria, Sandra Gibson and Luis Recoder’s kinetic light sculpture, into a synesthetic space of sound and light. Using her handcrafted Gliss Glass—water instruments that are drained and filled throughout the course of a performance—Bobrowski creates ethereal and immersive compositions of vibrant sounds and resonant light. Why do things give off light? There are many ways to make light, and all of them involve exciting atoms and molecules in some way. 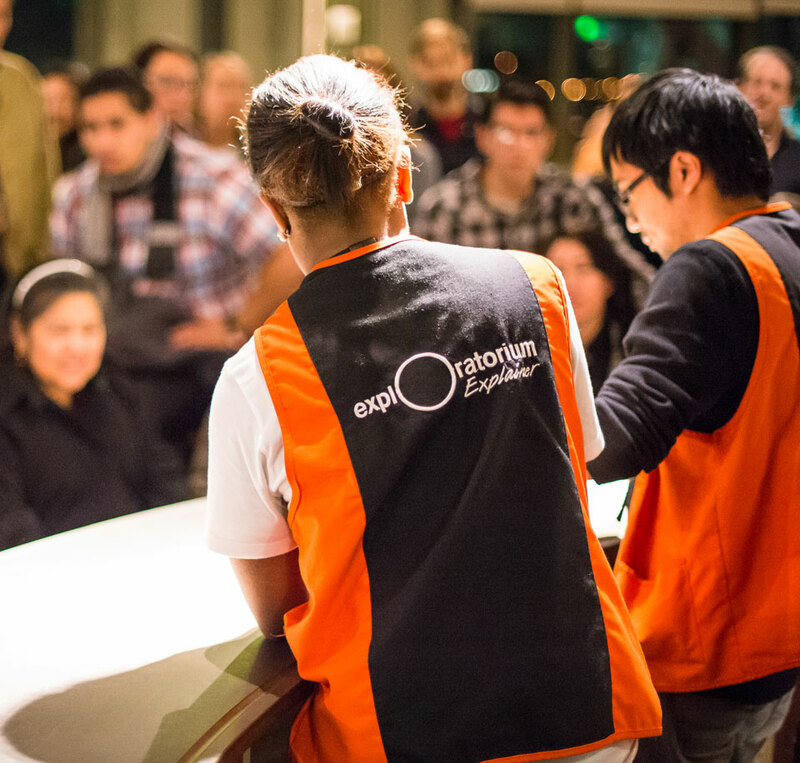 Join Exploratorium physicist Ron Hipschman to investigate some of the more colorful ways to make things glow. Using electricity, heat, and light, he’ll conduct a variety of demonstrations to illuminate the electromagnetic spectrum. Participants will receive a pair of diffraction grating glasses to take home. Learn the fascinating uses and history of the green fluorescent protein (GFP). First discovered in the jellyfish Aequorea victoria, GFP has been used extensively as a gene marker, granting researchers a visually identifiable affirmation of gene expression. See its luminescent effect in various species under the microscope, such as wriggling C. elegans. Squares features four 5-foot screens composed of white fabric, plastic, staples, and 576 LED pixels. Algorithms within the work display mathematical functions such as sine waves, magnetism, and Conway’s Game of Life. InifiniCube is a transparent box containing an infinite expanse of light. This spherical sculpture utilizes only 40 LEDs to create the illusion of an animated, holographic orb. While the LEDS spin in one direction, the timing of their flashes makes some lights appear to rotate the opposite way. This serenely surreal artwork is a prototype for The Koi Pond, a large-scale interactive installation that debuted at Burning Man 2016. Created to test assembly techniques, hardware, and video mapping for the larger project, this pond is comprised of roughly 60,000 LEDs and displays a high-definition video of slowly swimming koi fish, originally filmed at East Bay Koi in Oakland, CA. Enter the immersive vision of Joel Dream’s Portrait of Resonance and Chaos, an 18-foot kinetic sculpture made of large, mechanized pendulums ending in circular projection screens. Driven by algorithms that explore harmonics and chaos, its sixteen networked pendulums convey the musicality of emergent order, their screens illuminated with projected imagery generated, in part, by the movement of the sculpture itself. The Space Palette is a multidimensional instrument that lets you paint animations and play a musical orchestra simultaneously, by using your hands as three-dimensional cursors in the holes of a large, wooden frame. Instead of pre-recorded media, sequences, or loops, you create both musical notes and visual sprites in real time by improvising flowing, Tai Chi-like gestures with your hands. ORBIT n.3 is a high-speed, motorized kinetic sculpture which allows you, through persistence of vision, to visualize the path of a light point as it travels on two superimposed rotating axes, like a lamp on a Ferris wheel which rides upon a carousel. As the speeds of the perpendicular axes vary, interesting 3D graphs are produced. Spiroglyph allow you to visualize the path of a light point as it travels upon three superimposed rotating axes, like a rotating lamp on a rotating base which sits on yet another rotating structure. A surprisingly complex set of graphs are produced as the axes’ speeds and directions vary. The ingenious Nikola Tesla dreamed of creating a means to supply power to the world without stringing wires across the globe. The great inventor came close to accomplishing this goal when his visionary experiments with electricity led to his creation of the Tesla coil. Encounter 10-foot arcs of lightning from Electricus, a giant Tesla coil. And, probe more deeply, in the near-field of the same coil, where you become a human antenna, your touch can light fluorescent tubes, and you can share electric sensations with friends. Experience the power of wireless electricity. Make a miniature version of the Tesla Coil, a high-voltage, low-current must-have for any mad scientist’s laboratory. Unlike other light sources, lasers emit light of exactly one color, or wavelength. Take aim at the singular science of lasers​ ​through an interactive demonstration involving prisms, plexiglass, mirrors, and fog. Navigate the Laser Maze, a spy-worthy obstacle course made of light beams, play the Laser Harp's invisible strings made of light, and marvel at the Light Waterfall as a laser is guided by a stream of water. 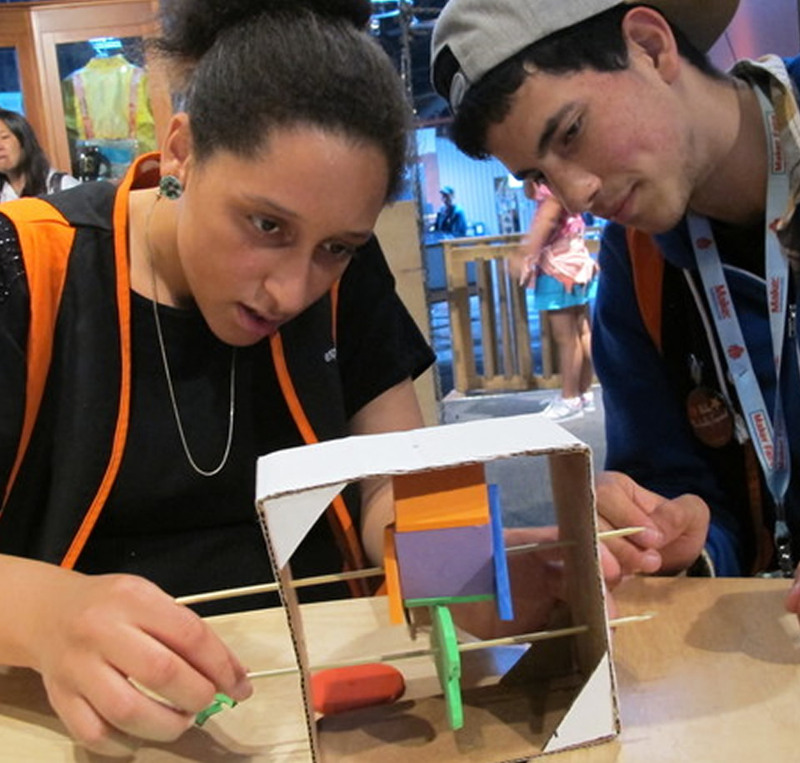 Make your own mechanical sculptures—known as automata—by tinkering with cardboard, craft foam, and other familiar materials. You’ll use simple mechanisms to make objects move up and down, turn around, or jump back and forth. Design a scene that you imagine, then build a simple machine to make it work. This activity takes about 45 minutes to complete.